Outta Theatre exists to provide performing arts training, creative opportunities, and high quality performances for people of all ages in the community to enjoy. We offer piano & voice lessons, acting & mime workshops, home school Music Adventures, summer camps, as well as Kids & Teen Theatre programs with regular performances. Outta Theatre provides practical training combined with performance experience in a safe, creative, learning environment. Instead of learning technique in a standard class setting or auditioning to be on stage for a specific production, the Outta Theatre experience combines the benefits of both worlds. Our programs create customized productions to enable everyone to get a part. Each student will enjoy the opportunity to develop their skills and confidence in the spotlight, and experience the energy of a live audience. Outta Theatre's versatility enables us to produce plays, variety shows, mimedramas, Cabarets, Murder Mysteries, and more! 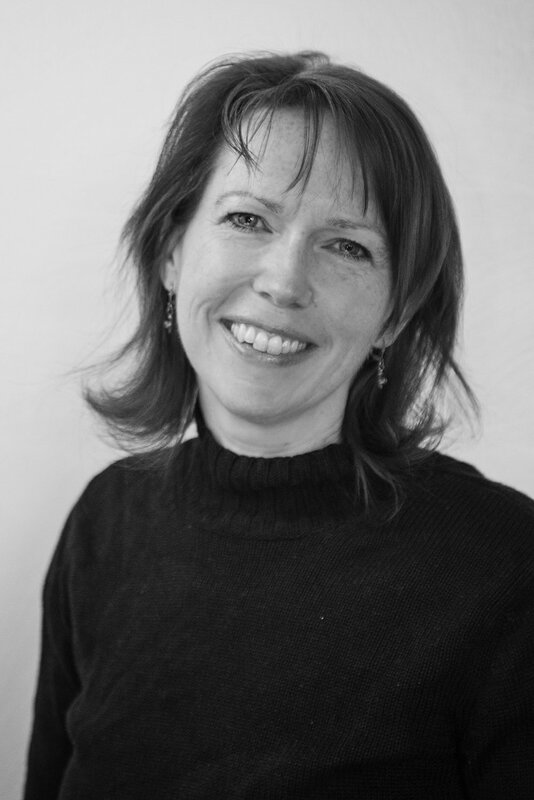 Over the last 17 years, Angie has traveled throughout the US and parts of western Europe, teaching and performing. She holds a Bachelor of Music in Music Education from Grove City College. After a year of teaching middle school choir and general music full time, she pursued three years of training in mime, dance, and theatre at Mimeistry International. During her final year, she mentored under story teller and published author, Melea Brock. She then graduated as a Journeyman Mime with a specialization in Directing. 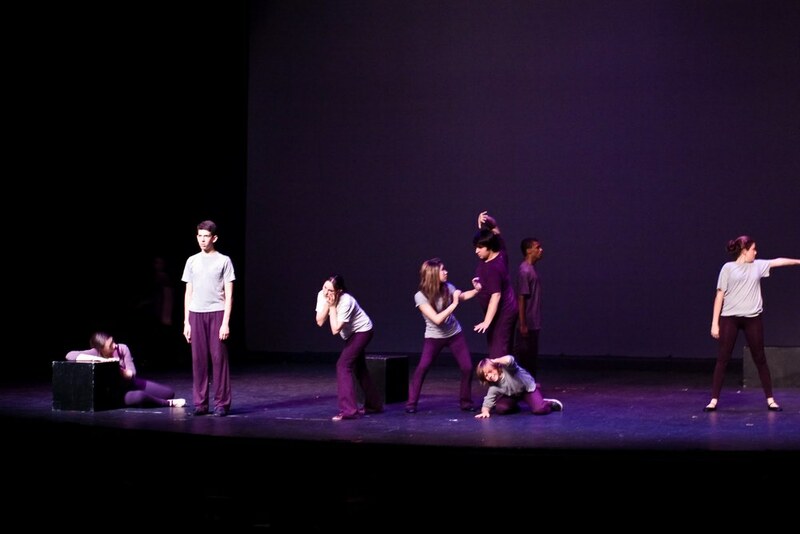 In 2006, Angie co-founded Tri-flections, an Imaginative Arts Organization, which performed and toured through 2008. 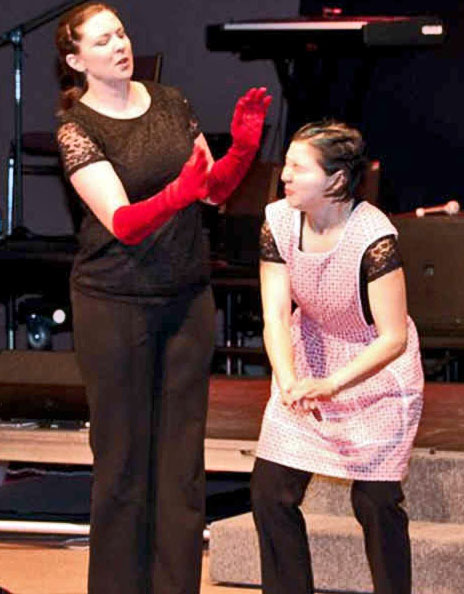 During that time she also assisted with the choreography and direction of the mimodrama, Alice in Wonderland at Calvin College in Grand Rapids, Michigan. In 2009, Angie moved to East Hartford, CT, where she performed in the premiere of Lights Up Productions’ new musical, Lost in Vegas. During her stay in Connecticut, she offered classes and workshops in the Hartford area through various organizations. 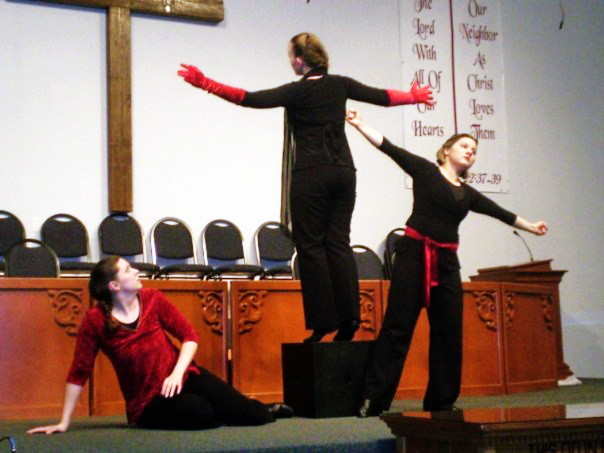 In the summer of 2012, Angie returned to Hartford to serve for the third year as assistant director and mime teacher for the Summer Musical Theater Intensive at the University of Hartford. The following December, she performed in the Barrow Civic Theatre's production of Miracle on 34th Street in Franklin, PA. In 2012, Angie began to offer private lessons and a theatre class for teens and tweens in the Grove City area. Since then, her business has steadily grown into what is now known as Outta Theatre. Other local experiences include teaching Kids Theatre for the Grove City Art & Theatre Summer Camp and teaching drama classes at the Alle-Kiski Music Day camp in New Kensington. 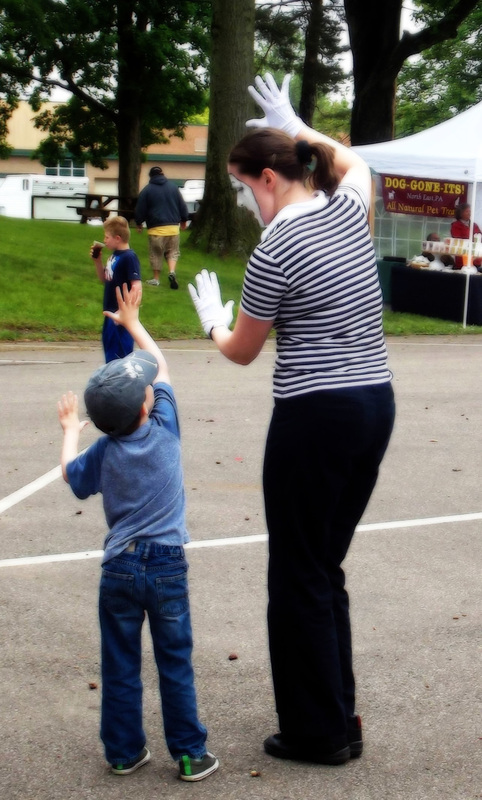 For the past two years she also taught mime/physical theatre workshops for the Grove City Artworks Artology initiative. 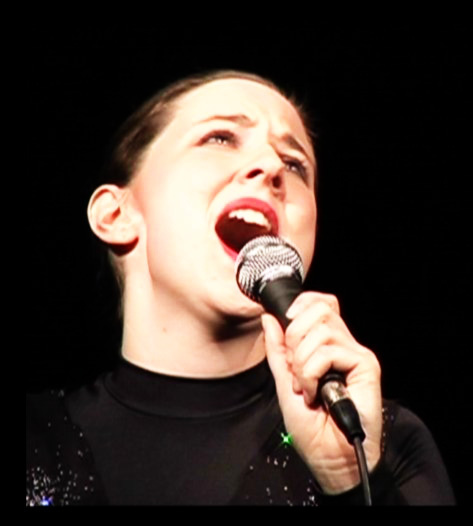 You may even have seen her perform as a mime at Strawberry Days and Grove City Art Walk, and she sang as a featured soloist at the Barrow's performance of Handel's Messiah, as well. In 2015, Angie became the director for Grove City Art & Theatre Camp and President of the board of Grove City Artworks. She plans to continue expanding her class offerings and to create inspiring, fun, family friendly student and professional level performances for the community to enjoy. Naomi is a freshman Honor Student with a major in Dance at Slippery Rock University. Her passion for the arts began as a young child when she started taking piano lessons at the age of five. The majority of her eight years of piano training were with Mrs. Arlene Cooper of Mercer, PA. She spent her high school years focused on developing her skills in dance, drama and voice. Naomi has taken a total of eleven years of dance. Crossroads Dance Academy has been her home studio since 2010. She spent three years with the Performance Company and three years with the Liturgical Company. She has taken a variety of classes including: Cecchetti, tap, jazz, modern, and pointe. Her senior year she won the Student Choreography Award at Showbiz Talent in Pittsburgh for a modern duet. She has experienced much joy from serving as an assistant teacher of children’s dance classes for four and a half years. 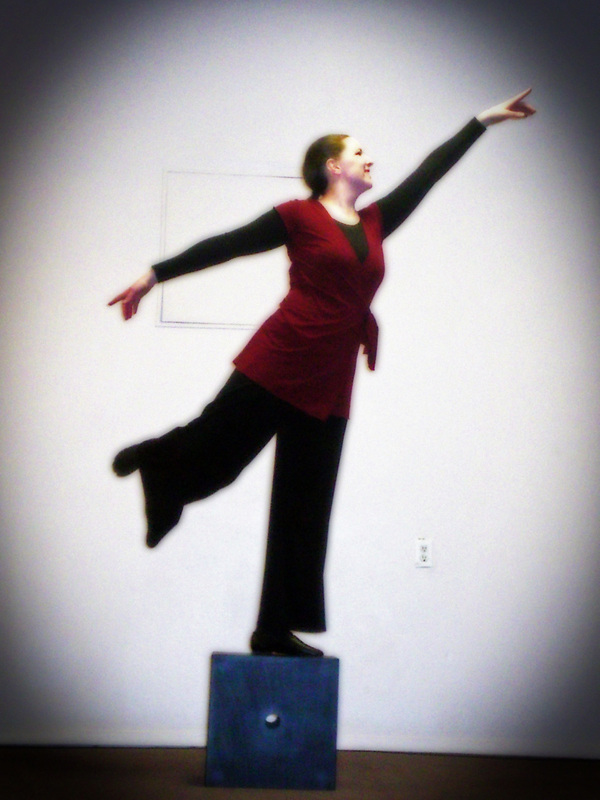 Currently, she is teaching a boy’s tap class at Crossroads and assisting with the boy’s acro class. Outta Theatre is where Naomi has fallen in love with all parts of theater. She participated in Teen Theatre for five years and has been a part of the cast for ten productions. In addition to acting, she also served as a member of the stage crew for thirteen Outta Theatre productions. Her favorite role was as stage manager for two of the Kids Theater plays. Naomi learned much by working beside Angie Settlemire as an assistant teacher/director for the 2015-2016 Kids Theater season. Through Outta Theatre, Naomi has also enjoyed taking mime/physical theater classes (summer workshops and 2016-2017 class) and voice lessons (2014 to 2017). Naomi also served as a 2017 summer intern for Outta Theatre. She is currently on staff as a teacher, stage manager, and assistant director for Alice's Adventures in Wonderland. Anthony has studied ceramics in Italy, Costa Rica, Peru, Belgium and the Netherlands. After receiving his Bachelor of Fine Arts and PA K-12 Teaching Certification from Slippery Rock University Anthony traveled to the jungles of the Dominican Republic to assist with the production and distribution of the silver enhanced ceramic water filter under the guidance of Master Potter Radhames Carela, providing over 3000 islanders with clean drinking water. You can find him making and selling his pottery under his “claylias” Mud Monkey Pottery. The pots he produces are created using locally sourced clays, rocks, and minerals which Anthony processes himself creating an aesthetic unique to the geography from which he lives. Influenced greatly by the ancient pots and traditions of Japan he aims to maintain a loose quality in the work reminiscent of these ancient wares. His works have been exhibited across the U.S. This is his fourth year as ceramic instructor at Grove City Art & Theatre Camp. 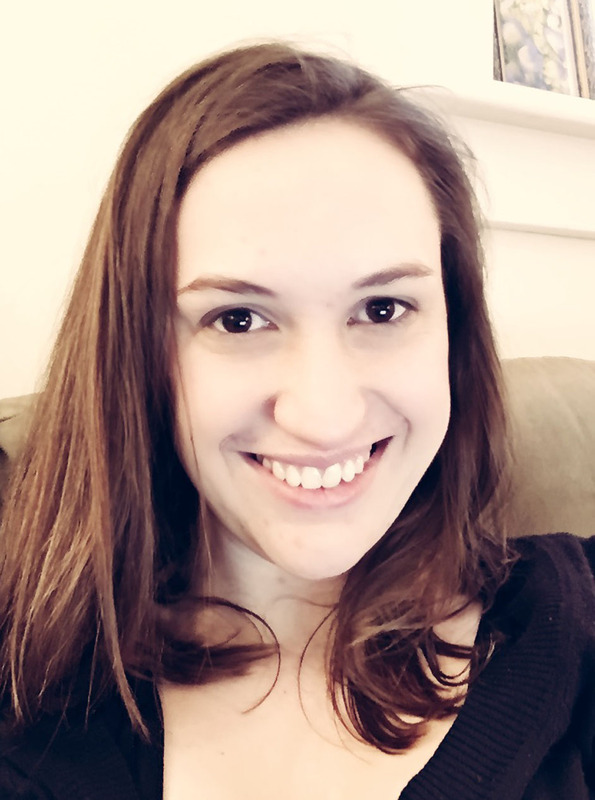 Teresa was born and raised in Plain Grove, PA. She attended Grove City College with a triple major in Communications, Art, and Literature, and specialized in Media and Theatre. She has been a home school teacher, co-op leader, and organizer nine years. Currently, she is an ESL instructor and high school instructor at The Creative Learning Christian School, as well as the Vice-Coordinator for the American Heritage Girls Troop PA0423. Faith Thompson is a second-year MFA candidate in poetry at Georgia College & State University, but she likes to spend her summers back home in western Pennsylvania. She loves spending time with her godchildren, petting her parents’ three cats, reading, and sewing! Angie is director of both Outta Theatre and the Grove City Art & Theatre Camp. This is her 5th year as a camp teacher. See full bio at top of page. Kelly's interest in photography proudly began in 1999 as a momtographer. Kelly's desire to get great shots of her kids led her to a hobby that ultimately went way beyond portraits of playful boys. She now takes many portraits and documents events, but her favorite reason to click the shutter is a found moment or scene while canvassing the streets of Pittsburgh or wandering around a farm. She started by learning the ins and outs on film with a Pentax ZX-5 and went to digital in 2005 also with a Pentax. She now shoots full frame digital on a Nikon D600. Recently she discovered the phrase, "unfamiliar visual experience" --a perfect descriptor of what she's always seeking from behind the lens. Shirley Berkey is a retired Grove City High School speech, drama, and humanities teacher as well as their theatre director. She has been an active crafter since childhood exploring the various arts concentrating on stained glass, mosaics, pottery, decoupage, painting, and design. Presently, she is an artist co-ordinator at the Collage Coffee and Art House in downtown GC. There she teaches craft classes to toddlers and adults, in addition to displaying and selling her stained glass work. Amy has been teaching art at Grove City Christian Academy for five years and creating artwork for longer than she can remember. She loves sharing her passion with others. After having lived with her husband and four children in Grove City for nearly seven years, she can truly say that she is invested in the local community and seeks to enrich it through the arts. Amy holds a B.S. in Art Education from Kutztown University and has had 13 years of experience working professionally with children. She has served as the Art teacher at the Grove City Middle School for the past 26 years. As a born again Christian her philosophy is "Our talents are our Gifts from God, and what we do with them are our gifts back to Him."